Search "maneki neko" 15 results have been found. 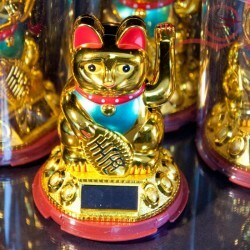 Lucky Cat Maneki Neko : Beautiful Cat Meneki Neko in ceramic lucky charm. The ideal object for your home, it brings you joy and good humor. It is decorated with cherry, bell, wisteria, chrysanthemums and petunias. 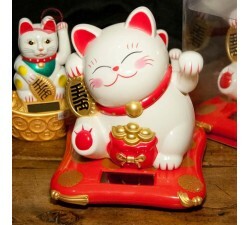 This lucky cat is a fun and bienvellante bank.weight 420g12cm waist height, 14cm wide. Bracelet Maneki Neko, lucky cat: This Japanese band will bring you luck, prosperity and happiness. It has in addition pearls Cat 6 red beads. It's an easy amulet to wear.The cat Maneki Neko is popular in Japan, they are in the form of bracelets statues ... it is an object Feng Shui. Chat Maneki Neko Cat Maneki Neko on his boat in sapecsVery nice cat Meneki Neko articulated. This cat maneki neko on his boat in sapec brings you luck and fortune. 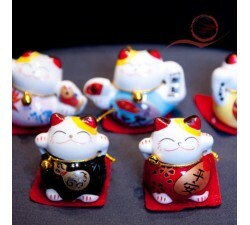 Chat Maneki Neko, red piggy bank Chat luck, Maneki Neko Red and white piggy bankBeautiful Cat Meneki Neko porcelain. The decorations are of great finesse. The ideal object for your home, it brings you joy and good humor. It is adorned with a bell. 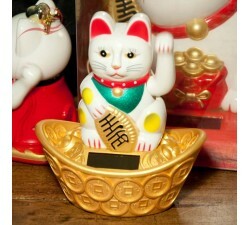 This lucky cat is a fun and bienvellante piggy bank for large and small.